There is something particularly dangerous about a dessert that is quick, easy, and insanely delicious. Rice krispie treats of any flavor are a great last minute dessert that can impress, especially now that the world of pinterest has made it all too easy to thumb through hundreds of different twists on this classic treat. I stumbled upon this recipe and knew I had to make it. My husband’s favorite candy is a Reese’s peanut butter cup, and I *might* have drooled over how pretty they looked. It’s kind of brilliant that these are basically plain rice krispies with peanut butter cup bits stirred in, which turn into melty swirls of peanut butter and chocolate. And the topping makes them look gourmet with minimal effort. The most difficult step in this very short recipe is unwrapping the candies, which you can totally get help with if you promise your volunteer that it’s okay if a few Reese’s go missing in the process. Since making these, I have been asked to make them on several occasions and they are always a hit. I double the recipe for a big gathering (I might have this unnecessarily HUGE brownie pan I fell in love with) which makes a sheet of rice krispies big enough to use as a pillow. Or inspiration for poetry. Or for sharing. Yes, lots of sharing. I actually mis-read the original recipe which calls for cocoa krispies, but I am so glad I did! These are perfect the way they are, with just the right amount of chocolate and peanut butter. Enjoy! 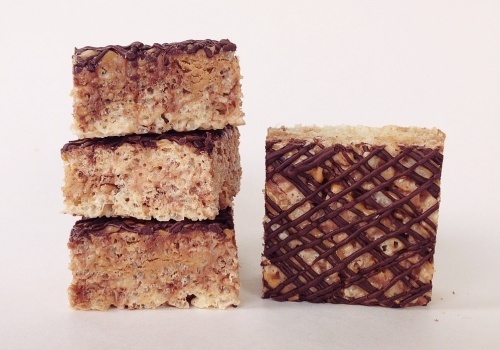 *note: Omit the Reese’s and the drizzle on top and you have the perfect basic Rice Krispie treat recipe. Keep it simple or experiment with other add ins! When peanut butter is cool enough to handle, transfer into a small zip lock bag. Clip a small piece out of the corner and pipe onto rice krispie treats, zig-zagging back and forth. Repeat steps with chocolate, placing in a small zip lock bag, and piping over the peanut butter. Either let treats sit at room temperature to allow chocolate to set up, or you can pop the pan into the fridge for about 5 minutes to speed up the process. Cut and serve. Remember, you can cut these however large or small you want. The picture above I have them cute pretty big. 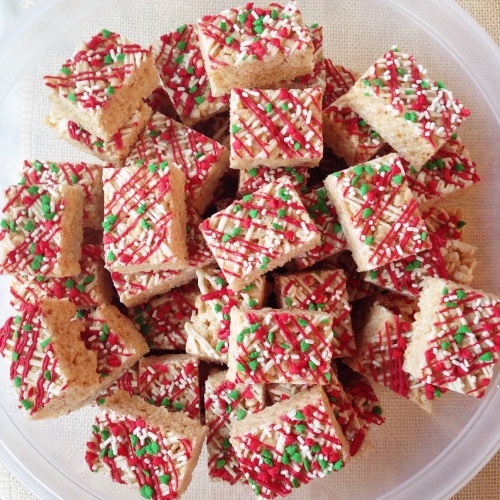 Below is a pic of this recipe used for plain rice krispies, cut into kid friendly sizes.